Poetry called to him in his yout h. Fresh from college, Jabari Asim sold TVs at a Sears in St. Louis and dreamed big dreams. When his first poem was published in Black American Literature Forum, that was all he needed to set him on his path. He left his job at Sears and took the leap of faith that led him to a successful journalism career with the St. Louis Post-Dispatch, The Washington Post and now his leading role as editor of the NAACP’s historic magazine, The Crisis. It brought him to children’s books too. A poet at heart, Asim found inspiration in his children. He turned silly rhymes he used to entertain them into stories that tickle and affirm littles ones around the world. 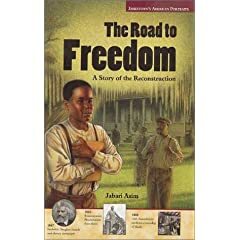 Along with his charming board books and picture book, Daddy Goes to Work, Asim authored The Road to Freedom, an important middle-grade novel about an African-American father and son navigating the challenges of Reconstruction. We are proud to feature Jabari Asim on the tenth day of our campaign. My desire to write for children arose naturally from my other interests. My wife and I have five children, and for years I was responsible for coverage of children’s books at the Washington Post. In addition, my wife was a professional storyteller and host of a local children’s television show when we lived in St. Louis. While there, I was commissioned to write a couple short plays for children by a theater company. It occurred to me that both scripts could be adapted for children’s books. I never got around to doing that but the experience nurtured the seed that was already germinating in my imagination. How did you begin working toward that dream? Both my avocation and my occupation enabled me to read voluminously, so that was the first step I took. I read and read and read before I really thought about sitting down in front of the computer. You’ve had such a rich literary career. You’re a journalist, playwright, poet. You’ve written and edited books about the politics of the N-word and American justice. You’ve been a syndicated columnist for Washington Post Writers Group and deputy editor of Washington Post Book World. How did that background inform your children’s writing? I was always inspired by Langston Hughes, whose career suggested that you had a better chance of actually earning a living as a writer if you showed a willingness to be proficient in as many genres as possible. Earning a living was important because I always had babies to feed. But all of the writing, regardless of genre, has always been informed and motivated by my life as a husband and father. I try to write books that will entertain, inform or stimulate my children. That goes for my books for adult as well: I hope that my children will eventually read them and find them useful. Who are some of your favorite children’s book authors? How has their work influenced you? There are more than I could ever name, so I’ll just briefly discuss those who have influenced me in some way. I’m a huge fan of Virginia Hamilton. Her version of The People Could Fly (Knopf, 1985) has seldom strayed far from my desk or my thoughts. I admire Patricia and Frederick McKissack too. They live in St. Louis, and I looked them to as role models when I was struggling. I used to say to myself that if they could make it, I could too. In time I got to know them through my friendship with their son Fred Jr., also a terrific writer. I also have tremendous respect for Eloise Greenfield and Tonya Bolden. Ditto for Joyce Carol Thomas, whose Brown Honey in Broomwheat Tea (Joanna Cotler, 1993) is one of my all-time favorites. And I don’t want to omit Dr. Seuss, a great poet in my view. His fondness for rhyme informs my own. The others have excelled in portraying warm, intelligent, brave, resourceful and loving African-Americans in a family context, and I’ve strived to do the same. Beginning writers are often told to silence their internal critic when working on a first draft. But as a nationally-renown children’s book reviewer, was that hard to do? My job reviewing books probably did make that a little more difficult, but when writing I do try to get as much of the idea or story on paper before thinking too much about structure. For me the point is to get the work out into the world—even if it’s just my own little world—and then begin to shape it. What was the toughest part of your journey to be a children’s book author? Initially I had to move beyond merely carrying ideas around in my head and commit to putting them out there. The second difficulty was in finishing them. I’m very good at leaving half-finished projects around to collect dust. The best part is the vindication I’ve received from parents and children. African-American mothers in particular have especially vocal and supportive—in every city I’ve been privileged to visit. Please tell us about your children’s book debut. What did that mean to you? I was approached to write a middle-school novel about the Reconstruction after my friend Fred McKissack Jr. recommended me to the publisher. I wrote a couple sample chapters and an outline and they gave me the green light to finish it. It’s called The Road to Freedom (Glencoe/McGraw-Hill, 2001) and tells the story of a father and son in the early days following Emancipation. It has managed to have legs, and I’m grateful for that. What do you hope children take away from your stories? On one level, I want to convince them that reading and playing with language is a joyful experience. On another, I want them to feel they belong, that’s there’s room for them in this world and they are entitled to its riches. How do you measure your success as a children’s book author? How important are receiving awards and recognition? Feedback has probably been the best gauge for me. At events I always try to engage with the parents and children and make sure there’s no distance between us. I honestly believe that I learn more from my readers than they learn from me. I’ve been lucky to receive some plaudits and recognition, and I’m happy about that but my happiness doesn’t depend on it. My mission is multifaceted but certainly includes a desire to function as a showcase for my fellow human beings—not exclusively African Americans but especially African Americans—to show that it is possible to be productive and fulfilled as an African American husband, father and artist. Let’s switch gears a minute and talk about the African-American children’s book industry. How has the landscape changed over the years? What gains have made you proud? What do you hope the future brings? Despite the noteworthy successes of some of our best-known African American children’s book authors, our foothold remains fragile. With a few laudable exceptions, we remain dependent on the whims and limited knowledge of publishing staffs that seldom look like us or know much about us. It’s an industry that remains largely, inexcusably monochromatic. My editors have, for the most part, been people of color, and their presence is living testimony that we have made some gains. At the same time, there are losses. As I write this, the area where I live has been deeply affected by the demise of the Karibu bookstore chain. On more than one occasion, event planners at Karibu paired me with Mocha Moms, an organization that has been wonderfully supportive to me and other writers like me. Few chain bookstores would have the interest or community knowledge to create and sustain those kinds of alliances. We are similarly dependent on events such as the multicultural children’s book fair at the Kennedy Center in Washington, and the African-American Children’s Book Fair run by Vanesse Lloyd-Sgambati in Philadelphia. These kinds of community-based events and institutions exist outside of the industry and are of inestimable value. In your new role as editor of the Crisis, one of the oldest black publications in America, you’re continuing a legacy blazed by W.E.B. DuBois. He was also the pioneer behind The Brownies’ Book, the 1920s children’s magazine published by the NAACP. Do you feel that your children’s writing is in keeping with an important African-American historical tradition too? It’s a grand and glorious tradition to which I humbly aspire. Hughes and Bontemps’ Popo and Fifina, Bontemps’ The Fast Sooner Hound (Houghton Mifflin, 1942) and Wonders (Boyds Mills Press, 1999), Effie Lee Newsome’s collection of poems for children, all occupy places of honor on my bookshelf. You started out as a poet. Your board books, Whose Toes are Those and Whose Knees Are These, have such a sweet lyrical style. Has your children’s writing brought you full circle to your roots? Absolutely. Poetry was my concentration in college, and I’ve been fortunate to have work included in several African American anthologies. I think I’d love rhyme even if I didn’t have that background, however, and my fondness for it had much to do with the creation of those two books. Those books evolved from nonsense rhymes I made up to entertain my children. 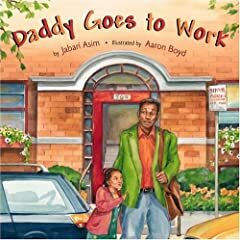 Daddy Goes to Work (Little, Brown, 2006) is a fictionalized version of my real-life workplace adventures with my daughter. Your children’s books span board books to middle-grade. What’s up next? I’m working on another pair of board books, Girl of Mine and Boy of Mine. LeUyen Pham, who did Whose Knees Are These (Little, Brown, 2006) and Whose Toes Are Those (Little Brown, 2006), is on board to illustrate them. I believe Little, Brown plans to publish those in 2009. After that, I’m readying a y/a novel about a young African American boy that is in the tradition of Philip Pullman and J.K. Rowling. I’m hopeful it will find a home. How do you strike a balance between the different parts of your life – husband, father, author, journalist, playwright, poet? I try to take a holistic approach. My home office has no door, so my wife and children are constantly interacting with me even as I write. I think the various parts of my life blend into one another because they all bring me joy. I love being with my family. At my day job, I have pictures of my children all over my office. I’m the type who can’t wait to get home. I’ll also find any excuse for my wife to visit me at work. She’s my soulmate and I’m smart enough to stay close to her as much as possible. For more about Jabari Asim, please visit him on the web at www.jabariasim.com. I really like Jabari’s mission. I don’t have one myself, but I think I’m gonna adopt his. Very nice. I first read Asim in his Washington Post columns. I used to look forward to Mondays because that was the day my local paper printed them! Then I bought the two Whose… board books for my sons and we LOVE them. Now I eager to read everything else he has written. I am so pleased to read here about how important his fatherhood and husband roles are to him.